Alley Of Books: Khy Meets Me. Or Vice Versa? I am very impatient. It's not a very well known fact. In fact I hate waiting in lines for anything. 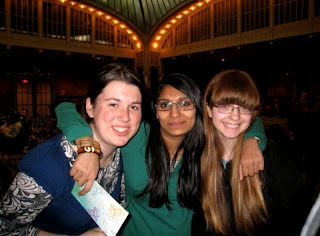 So imagine my response when I saw (Back in March) on the NYPL website an article on the Teen Author Festival. It was my Spring break. I'd been out to the city all day with my friends the previous day and was still exhausted. But I saw one name jump out to me. Or two. Maureen Johnson. Cecily Von Zeigesar. MAUREEN JOHNSON AND CECILY VON ZEIGESAR. How could I not go? Suite Scarlett and Gossip Girl creators. How could I give up this amazing opportunity?! (Cue: Fangirling may begin Zoe & Khy ). March 20th might as well have been the day that my life changed. I hate getting stuck in traffic so I got outta my apartment early and got to the library way to early. So I decided to go across the street to get a Starbucks Banana Chocolate Chip Cake (the significance of which will be revealed as the post goes on). When I returned there wasn't anyone else there except me. So I decided I wasn't going anywhere. In case you know anyone else showed up and I missed my spot. So I was waiting there when this girl shows up and she goes up to the security guard and asked him is the Maureen Johnson event here? He said get in line behind that girl (pointing at me). She looked about 17 and came up to me and stood behind me and kept checking her cell every few minutes. I decided to talk to her. You know in account of both of being here all alone. So I was going to turn around when this other girl and an older lady came and stood behind her and they got started talking. So of course I had to wait because it would rude to interrupt. But I could hear what they were talking about. So I technically I wasn't eavesdropping. I heard the first girl's name was Valentina and the other was named (for all intents and purposes) Khy. and her mom. So at this point I had to chime in or I would start feeling guilty. So I chime and say hi I'm Mitali blah blah blah. Val was from Florida here for a school a trip and Khy was on premature spring break (we'll just leave it at that) from Cali. I was of course fascinated. I had the opportunity to make two new friends outside of NJ right? (Who knew 2 would become over 20). Hate to say this but this is where I leave you folks. But till then enjoy this pic of me with Khy & Valentina! Khy is a cool person to meet. Thanks for telling us the story Mitali! "Khy was on premature spring break (we'll just leave it at that) from Cali."